SMS Marketing in the UK from 2p per SMS. By design, our SMS platform is packed full of comprehensive features yet is incredibly simple to use and very fast. As one of the pioneers of online SMS from as far back as 2003, we've maintained our reputation of reliability, security and customer service. Create and send SMS messages online with the ability to save messages as templates. Upload PDF, JPG, TXT & other files and the platform creates a trackable shortlink in your message linking to your content. Create custom fields and personalise each message (in a similar way to Microsoft Mail Merge). Feature packed online phonebook including user groups to provide an easy way to keep your contacts organised. Whether you have just 10 or 10,000+ contacts in your phonebook groups, the service scales easily to your needs. When sending SMS to large groups where callbacks are expected, messages can be sent more slowly & between certain times to allow staff to deal with callbacks. Fully compliant with messages up to 612 characters in length. Change the 'From number' to be your business name or business number. Included 'reply number' to allow people to reply to your messages. Add and 'unsubscribe' option with a single click. Extensive SMS delivery reports including dead number quarantine to save you money. 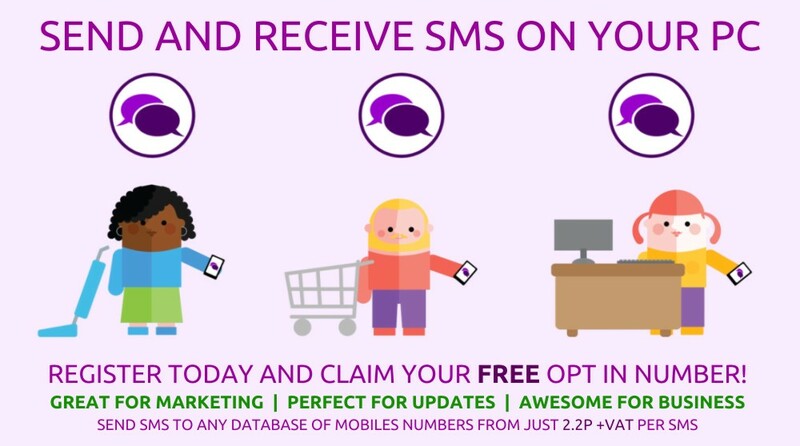 Free to use service, just buy SMS as you need them from as little as 2p each. Your data & security is paramount to us. Our Tier 1 direct to network connection means there are no 3rd party or overseas companies involved in handling your message in transit ensuring your data remains secure. Logon to our service is also SSL secure and Communicloud is ICO registered for your complete peace of mind. There are no hidden catches - just fuss free SMS messaging from just 2p per SMS. Read in more detail about our SMS service. | Back to plans. Get started today and we'll give you 10 free SMS! Our SMS marketing tools are second to none and have been designed with business in mind from many years of experience and tweaks. In fact many features come pre-bundled as standard on top of the SMS Starter package. Everything included with the SMS Starter Package. Choice of numbers end users can text to including a virtual mobile number or 5 digit shortcode. Choose your own keyword or pick from a provided list. Set a personal automated reply message or disable automated replies. Number automatically added to the correct phonebook group. An email alert can be set to be sent to one or more recipients in your business. Create mobile friendly surveys for end users to complete. Upload marketing flyers in PDF or JPG format and the system creates a shortlink within each SMS that are fully trackable. What will it cost our business? An opt in keyword on a virtual mobile number (eg 07716 711744) is free if you choose from a pre-defined list of generic keywords or �5 per month to choose your own. There are no hidden catches - set up your own opt in service completely free. Read in more detail about 5 digit shortcodes. | Back to plans. If you are looking to use SMS as a way to generate revenue, our Premium Option offers rates that can charge end users who interact between 25p and �4.50 per text message. (Normally text ins cost the user a standar rate message). Please note that this option IS NOT included in your starter account as standard as the service is regulated. More information is below under 'How we get started'. Couple the Premium Option with the Competition Option to quickly offer text in competitons at a premium charge. The Premium Option costs �75 per annum (to cover banking and transfer fees) and each text in keyword costs �25 to setup and �25 per month. You will need to be registered with PhonePayPlus, the premium rate regulator. The first year is free and thereafter is free unless you generate in excess of �10k per annum where a nominal fee applies (appx �150). To ensure your service is compliant with the regulations a one off fee of �120 is payable. This covers all marketing including avenues such as promotional material, websites and TV/Radio marketing. Getting your service compliant may be a simple process but typically takes around 3-7 days and will involve 1 to 1 liason between your business representitive and Communicloud. Usually you will need to submit your marketing material for review and we will advise on what needs to be done to make it compliant. Each change needs to be reviewed. As explained earlier, you will need to be registered with PhonePayPlus, the premium rate regulator. Once you have your registration number get in contact with us. Next we need to ensure all marketing material is compliant with the regulations and once everything is in place we activate the Premium Option. Communicloud perform continual monitoring of your service to ensure any changes you may make still comply. Read in more detail about our Premium Rate service. | Back to plans. Communicloud provide an effective way to offer competitons by SMS. This could be a simple Raffle style (just text in to enter) or a more traditional ABC style where end users must answer a question and text in with their answer, A, B or C.
Simple Raffle style where end users simply send a text to enter and recive a text with a validation code. More traditional ABC style where end users send their A,B or C answer by text to enter. Set start and end times and limit how many times end users can enter of required. Operate up to 3 competitions simultaneously. Personalise a reply message, which can include a link for more information on your website or Facebook page. Competition entries can be at standard text rate or if you wish, activate the Premium Option where each entry to your competition can cost 25p, �1.00, �1.50, �2.50 or �4.50 chargeable to the end users bill. Our system can pick a random winner for you. The competition Option costs �75 per annum. You will also need at least one keyword on our shortcode. These cost �25 to setup and �25 per month. If you wish to offer the competition at a premium charge to enter, additional fees apply and you must also be registered with PhonepayPlus. See the Premium Option for further information. Simply get in touch. We can activate a 'free to enter' Competition Option within 10 minutes. A competition using premium rate can take a few days up to a week to get fully compliant and activate. Read in more detail about Competitions. | Back to plans. Communicloud offer virtual PBX telephone exchanges to provide VOIP and IVR services seamlessly for your business including a free 01, 02, 03 or 08 phone number. Advantages of VOIP vs a fixed phone line. If you are familiar with VOIP you can skip this section. Traditionally, especially where people work from home, your BT phone line provides both the ability to call and have internet access. However, the phone number allocated may not be practical to your business (perhaps it is also a home number) and without diverting calls it neither transportable or transparant. VOIP allows you to have any number of additional phone numbers beginning with 01, 02, 03 or 08. There are 1000's of numbers to choose from and 01 or 02 numbers allow you to choose a number in the same area zone - although you can choose a different one. Some companies prefer to have a London style telephone number even though they may be based in the NW of England - or even abroad. To receive VOIP calls you need to have at bare minimum either a mobile phone that has WiFi or 3G, 4G data access with free VOIP software installed such as CSip and Zoiper which are both free or a desk phone that supports VOIP / SIP. If you prefer a desk phone, don't worry we can advise on what to buy. VOIP does not route calls to your phone line. Instead it routes them over the internet. This offers great benefits since as long as you have internet access you can receive calls from your VOIP phone number anywhere in the world either on your mobile phone or via a VOIP enabled desk phone plugged into an ethernet socket. We include cloud based, virtual, managed PBX systems which can be stand alone or shared. PBX (private branch exchange) is the software/server that acts as the exchange to handle and route all calls. Basic package - calls route to VOIP extension. 4 extensions included. Business packages - calls route to IVR to answer and handle calls. 4 - 200 extensions can be configured. Calls can be transferred between them or talk to each other. Option of fully secure, managed, shared or dedicated virtual PBX phone exchange. Call recording and forward built in as standard. Auto transfer on busy or away. Call out via dedicated VOIP number or save money by calling out via minutes included on SIM cards we can host or provide. Quotations vary as do setup fees, but a basic package costs from just �5 per month. For a small business with 10 extensions (mobile or desk) which can interact plus a dedicated, fully managed, cloud based PBX server with IVR to answer calls, costs would be typically �45 per month. Call out charges are not included here and VOIP calls cost around 1.5p per minute. Many businesses take advantage our SIM route. This simply means we host SIM cards that you can use to dial out from. Calls can be reduced to 1/4p per minute (typical SIM contracts give 3000 landline and mobile minutes for around �7.50). Simply get in touch. We can offer the best advice and VOIP solution to fit your needs. This service is not available in the starter account and is configured seperately. Read in more detail about IVR, PBX and VOIP. | Back to plans. Communicloud offer developers the option of being able to send/receive SMS easily using HTTP/HTTPS (POST or GET) or SMPP. Send SMS using HTTP/HTTPS via PHP CURL, Perl LWP etc. Retrieve SMS balance via a HTTP call. Where the message for each handset is identical, up to 6000 numbers can be included in a single post parameter - giving an equivalent 7-8000 SMS/second transfer rate. Up to 40 SMS/sec for single HTTP calls. Parameters available to personalise FROM name or number and set delivery times. Secure posting using API KEY. Dedicated SMPP server if you require SMPP instead. Advanced reporting by FROM name, number used, date range, etc. It's a free service too! The Developer Option is included - even with the SMS Starter Package. You simply buy SMS as you need them. Messages do not expire within your account. Register free below. The API options are avilable under 'Developer Zone' within your admin panel. Read in more detail about the API or read the documentation. | Back to plans. Communicloud offer a versatile range of text to screen services. Text to screen allows interaction between end users sending an SMS and it being received in a variety of ways on large screens at your venue, moderated or un-moderated. No software to install. Runs in console mode (full screen) of most major browsers. Works anywhere with stable internet connection. Wide range of options including slideshows alongside messages, messages only, scrolling messages and more. Perfect for any venue including conferences, events and even pubs and clubs. Bespoke background and screen designs. All numbers that interact including messages sent are stored in your online phonebook. Operate at standard rate or charge end users a premium charge of between �25p and �1.50 to interact. What will it cost our business. Costs vary depending on the service and the amount of bespoking required. For small venues with a standard package using it continuously it costs from �80 screen design, �25 setup and �25 per month. Corporate events that require significantly more work, higher quality designs etc inc powerpoint conversions typically cost �80 setup, �125 bespoking and �80 per day. If charging end users a premium rate rather than standard text rate is required additional fees will apply as per the Premium Option. Register free below. The Text to screen options are a standalone service that will be activated by a representitive after registration. You can call us on 033 33 444 959 for additional information or to discuss your personal requirements. Read in more detail about the Text to Screen Option. | Back to plans. Communicloud have a team of highly skilled developers who specialise in SMS and VOIP services. If you need a service bespoke to your needs or help connecting with us in your own way, our team are here to help. Server familiarity in Windows Server and Linux Servers including Ubuntu and Centos. Bespoke Web Service hosting on dedicated cloud platform. PBX and VOIP services and customisations. White label SMS and VOIP platforms. Short turnaround time typically 1-7 days. Many packages already built for easy deployment. One to one with development team leader. Please get in touch with our team to discuss your requirements on 033 33 444 959. Register free below or call us on 033 33 444 959 for additional information or to discuss your personal requirements. Our cloud based services mean we can manage services on your behalf with minimal input on your behalf. Whether you simply need to send SMS broadcasts to a group of people or need a corporate VOIP platform with 100's of extensions, we we can manage it all. Managed SMS, Shortcode and Marketing services. We monitor all services and manage opt ins and more. Uploading and processing of end user number spreadsheets and data. History tracking, daily reports and more. Configuration of extensions and trunks. Managing of optional SIM cards and minute management. Automated cloud configuration backups and disaster recovery. Bespoke interactive IVR recording and call flow. Firstly, you need to register free below or call us on 033 33 444 959 for additional information or to discuss your personal requirements. ✔ Easy integration. 128bit security. Communicloud is a leading UK based Telecomms provider offering commercial grade cloud based SMS solutions, virtual PBX exchanges and VOIP extensions for businesses. Our SMS platform allows you to send and receive SMS online and create advanced SMS Marketing campiagns. Send SMS to unlimited recipients with great features such as mail merge, dynamic short urls and attachments. Brand messages to show from your business or use our free reply numbers to receive text replies direct to your admin panel. Track delivery and monitor your campaigns to maximise results. Creating marketing campaigns with a 5 digit shortcode number is a breeze too. Receive immediate notification by email and relax in the knowledge that all numbers are being stored to your online phonebook. Don't just settle for SMS. We also offer virtual mobile and landline numbers and can route calls via VOIP. As an industry first, not only can people respond by SMS, but can also call you directly. Our interactive IVR platform can answer the call and play recorded messages and direct the call to the correct department within your company. Browse our services above and when you've decided what you need, get started for free. Learn about how our services can help your business. Find out how using SMS and Shortcodes can revolutionise your marketing and grow your client base..